As of 9am (UK time), today, 12 September 2012, OpenStreetMap is now licensed under the Open Database Licence. Thank you Open Data Commons for making legal tools available for the Open Data community. The XML-format Planet file took longer to generate than expected. It is now available in the new directory structure at http://planet.osm.org/planet/. You may experience slow downloads due to demand at this time. Additional PBF-format files will follow as soon as they are completely generated. This entry was posted in Legal, Operations, osm.org and tagged license, License change, ODbL on September 12, 2012 by Richard Weait. The change to ODbL is imminent. No, Really. We mean it. At long last we are at the end of the license change process. After four years of consultation, debate, revision, improvement, revision, debate, improvement, implementation, coding and mapping, mapping, mapping, it comes down to this final step. And this final step is an easy one, because we have all pitched in to do the hard work in advance. The last step is so easy, it will be a picnic. On Wednesday, 12 September 2012, generation of the next Planet file will begin. At that point, the API will switch over to ODbL and OpenStreetMap will be an ODbL-licensed Open Data project. API transactions and diffs consumed after that point will consist of ODbL-licensed OpenStreetMap data. About thirty hours later, that newly-generated planet file will be available from planet.openstreetmap.org for you to consume with your renderers, routers, QA systems, convertors and re-imaginers. You won’t want to mix ODbL diffs with old license planets or diffs. Purge and reload your systems with the ODbL planet. Then consume the ODbL diffs. Planet will have a new directory structure. We’re taking this opportunity to rationalize the layout of planet directories a bit. You should find it easier to understand afterwards. This also means that you won’t accidentally mix data of different licenses. Mappers shouldn’t see a difference and won’t have to change their mapping. Continue to improve OpenStreetMap by mapping from your own survey observations and using OSM-approved external sources. Never copy from other maps. If you consume OpenStreetMap data and publish it, we have some guidance for you on the wiki. You’ll want to consider your obligations under the new license and then proceed to purge your old data and switch to the new. Many consumers, such as custom renderers, will only need to update their attribution of OpenStreetMap to the new simplified attribution. Data consumers may time their upgrades to the new planet and diffs at their convenience. in case of rain, we won’t cancel this picnic, just reschedule it for the subsequent Wednesday, 19 September 2012. 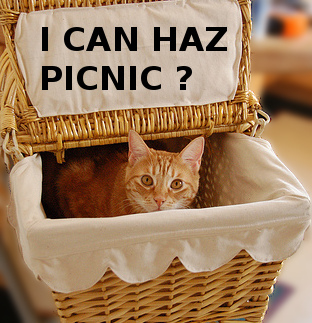 Photo of cat in picnic basket is © Jacob Davies, licensed CC-By-SA. This entry was posted in Legal, Operations, osm.org and tagged CC-By-SA, license, License change, ODbL on September 11, 2012 by Richard Weait. We’re planning the final stages of the switch over to the Open Database License for OpenStreetMap data. The OpenStreetMap Foundation Board discussed the license upgrade process and many other aspects of the project at their recent board meeting, and we’ll have more information about that from the board shortly. One item that came out of the board meeting was the deadline to complete the license upgrade by 01 April 2012 and to publish the first OpenStreetMap planet file under the ODbL by 04 April 2012. The License Working Group supports this target date as a reasonable goal. There are still many things to do before we are ready to publish the first OpenStreetMap planet file as an ODbL database. As always, community engagement and your participation are important. There will be more information and details on your favourite OSM community channels including the mailing lists and IRC. For now the process of contacting mappers yet to respond and remapping non-compliant data is still the priority. There are various tools to help you get an idea of ODbL coverage in your country, or your local area. In particular, you can enable a view within Potlatch2 or install a plugin for JOSM to see the license status of elements. This entry was posted in Board and tagged Board meeting, CC-By-SA, license, License change, ODbL on November 16, 2011 by Richard Weait. Just announced on legal-talk is that Phase 4 of the license change process is scheduled for this Sunday, 19 June 2011. During Phase 4, the 166,000+ contributors who have accepted CT/ODbL will be able to edit. That is, the 406 contributors who have declined CT/ODbL will not be able to edit after phase 4 has begun. Those who have declined with their existing account may reconsider or may open a new account to continue editing. Those who have already accepted should be unaffected by the move to Phase 4. If you have an unexpected problem with editing, please see #osm-dev on IRC. This entry was posted in Legal and tagged license on June 14, 2011 by Richard Weait.